In 2014, John Mercanti and the Perth Mint made numismatic history with the introduction of the Wedge-Tailed Eagle Series. It was the first time that a former Chief Engraver of the United States Mint partnered with a foreign mint to create a legal-tender coin. Since then, Mercanti's skill in design and engraving combined with the Perth Mint's exceptional production quality has given flight to what has since become a beloved series the world over. The Mercanti-Perth Mint partnership continues in 2019 with the release of a new one-year-only design that is sure to have particular appeal to collectors. For this year’s design, Mercanti, the 12th Chief Engraver at the U.S. Mint, has given us a portrait of an eagle in flight descending against a backdrop of sun rays, its talons extended as if closing in on its prey. Struck in a full ounce of highly-pure 99.99% silver, it’s a magnificent design that celebrates Australia's largest bird of prey – a design that could have originated only from the brilliant talents of John Mercanti! 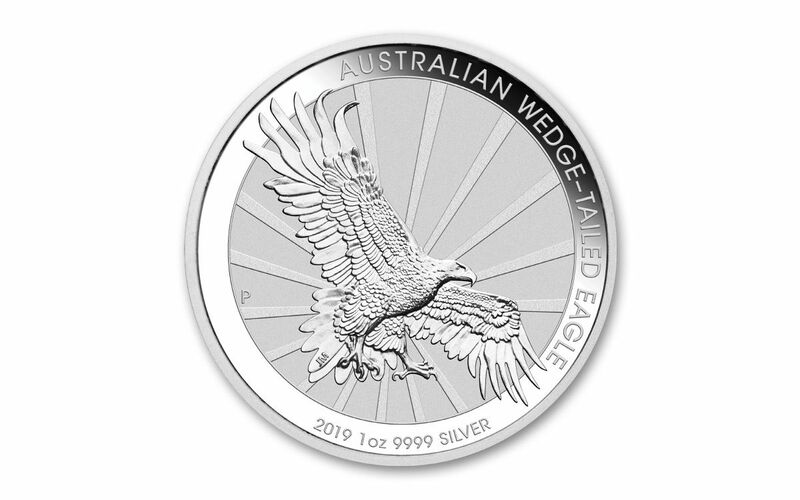 Now you can add a lot of silver to your collection by taking advantage of this offer to secure a 100-coin tray of 2019 One-Ounce Silver Wedge-Tailed Eagles. With a mintage of only 50,000 coins, you will need act fast because they won’t be around for long. Since taking flight, this series has been immensely popular, so order now Click a tray to your cart today! 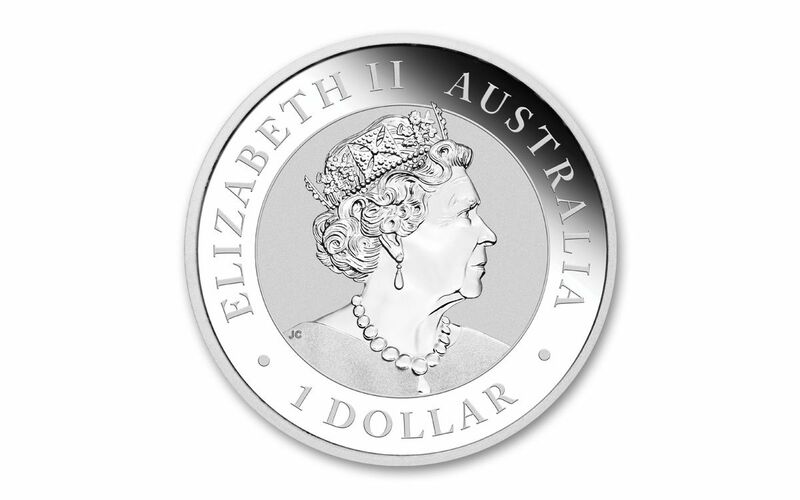 STRUCK IN HIGHLY-PURE SILVER – Each 2019 Wedge-tailed Eagle coin was struck from one ounce of highly-pure 99.99% silver at the Perth Mint, which is represented by a "P" mint mark on the left side of the reverse. The Perth Mint is revered by collectors throughout the world for the consistent, outstanding quality of its coins. AUSTRALIA LEGAL TENDER – The 2019 Silver Wedge-Tailed Eagle is one dollar legal tender in Australia. 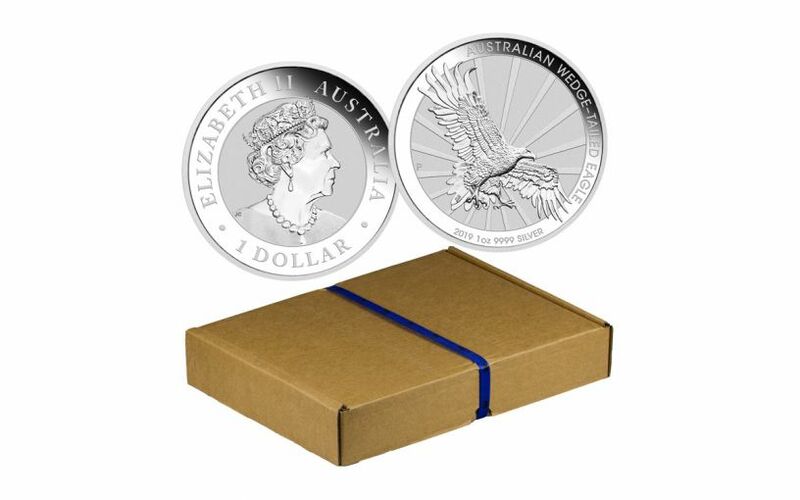 GLEAMING UNCIRCULATED CONDITION – Each 2019 One-Ounce Silver Wedge-Tailed Eagle will come in gleaming Uncirculated condition with a sharp strike and original mint luster – just as it left the mint! A LIMITED MINTAGE – Although this series has become a favorite among collectors, this mintage will consist of just 50,000 pieces. The release of the 2019 One-Ounce Silver Wedge-Tailed Eagle is a major numismatic event, one that collectors, silver stackers and fans of John Mercanti’s work will all be vying to secure. Don’t miss your chance to acquire this fabulous coin. Order your 100-coin tray now!